Generally older people suffering from Arthritic conditions. Arthritis affecting only the joint between the knee cap and femur (the patello-femoral joint) may be suitable for patello-femoral resurfacing. In patello-femoral resurfacing a plastic component is put on the back of the knee cap and a metal component on the front of the femur leaving the main knee joint between the tibia and the femur alone. Patello-femoral resurfacing is a relatively new technique compared to total knee replacement, but is successful in patients who have a certain type of osteoarthritis. Your consultant will discuss this with you and your suitability for this procedure. The symptoms and conditions of arthritis are complex. The more commonly associated, wear and tear, osteoarthritis is a degenerative condition, starting from gonarthrosis and progressing through a number of stages to acute arthritis. Your consultant will, through examination, determine the extent of your arthritis and discuss options for treatment available to you. Arthritis canbe diagnosed from plain x-rays. It may be necessary to obtain detailed information on the knee prior to surgery and therefore you may be asked to attend for an MRI or CT scan. Arthritis is progressive and therefore lifestyle changes, for example to avoid impact exercise will elongate the time before a total knee replacement is necessary. Physiotherapy can give increased joint movement. Eventually it is likely the pain will become unbearable or quality of life will be such that the only option is to have a knee replacement. The operation is normally performed under a spinal anaesthetic as this is generally safer and provides excellent post-operative pain relief. Some patients are worried about being awake, however the level of sedation can be varied such that patients can be as awake or asleep as they wish. The operation involves an incision over the front of the knee. The patella and muscles attached to it are pushed out of the way to expose the joint surfaces. The worn out bearing surfaces of the knee are resurfaced with a metal implant covering the worn out groove in the end of the thigh bone ( femoral trochlea) and a polyethylene button on the back of the kneecap (patellar button). As little bone as possible is removed to allow an implant that closely matches the size and shape of the patient’s bones to fit accurately. If the knee has become deformed as arthritis has developed then the bones are cut in a way to correct this deformity. The skin is normally closed with staples as these allow full flexion of the knee with minimum risk of the wound opening up. The knee is wrapped in a soft padded bandage for comfort and to minimise swelling. This is removed the day after surgery but the wound is kept covered with a sterile dressing until it is completely dry - normally one to three days following surgery. The aim is to mobilise patients as soon as possible after surgery - on the same day or the next day as this helps speed recovery. Most patients remain in hospital for three to four days but there is no fixed limit and patients can go home as soon as they can walk safely with elbow crutches and manage whatever tasks they need to perform at home. Physiotherapy is an integral part of the recovery process and we have physiotherapists who are specifically trained in the rehabilitation of knee replacement patients. They will guide you through the recovery process and assess that you are safe for discharge. Recovering from a knee replacement is hard work in the first few weeks. The knee will feel stiff and sore. This is normal and nothing to worry about and it is important to recognise this and the need to get the knee bending and straightening despite the discomfort. Patients should aim to increase the range of movement they can achieve on a daily basis and that the only way to increase the range of movement is to push the knee in to the uncomfortable zone as in general whatever movement is achieved in the first few weeks is kept for life and it is extremely difficult to increase the range of movement after his time. Most patients do not require out-patient physiotherapy but for patients who are finding the recovery process more difficult then further physiotherapy can be of great assistance and will be arranged if necessary. Remember that walking will come back naturally and does not need to be pushed. The range of movement will not and this needs to be worked at. Patients who try and do too much walking in the weeks after a knee replacement tend to find that this irritates the knee and it becomes more swollen - this swelling can then restrict the range of movement of the knee in the vital few weeks after surgery when the window of opportunity to regain range of movement is still open. most patients are able to drive 3 to 6 weeks after surgery and discard their elbow crutches during this period. It takes a year to get the best out of a knee revision. Surgery is followed by a prolonged course of physiotherapy. This requires a commitment to undertake this rehabilitation in order to achieve the best possible result (at least half an hour per day for 6 months). It is vitally important to stay within the post-operative activity restrictions and physiotherapy guidelines to avoid damaging stretching your replacement knee. When you can walk without crutches or a limp and be in control of your vehicle (about 3-6 weeks). A knee revision is successful in relieving all or most or the pain from an arthritic knee in about 90% of cases. This means that 10% of patients have some pain although most of these feel better off than they did before. Overall greater than 90% of patients are happy with the result of their knee revision. A small percentage of patients sustain a complication that can potentially leave them worse off. In general the level of this risk is approximately 2%. My aim is to provide each patient with a knee revision to last their life. 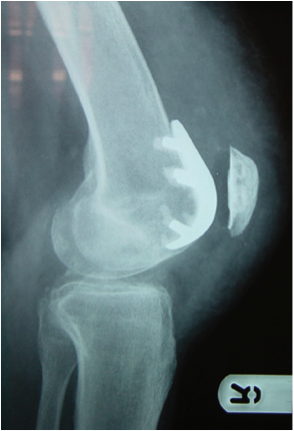 Statistics suggest that 90% of knee replacements are still working well ten years down the line. However they are mechanical devices and will therefore wear out. The length of time a knee revision will last in any one individual is very difficult to predict but a good analogy is that of asking how long a new car will last and of course this depends on how far and how well you drive it!